On 11 and 12 June 2017, the General secretariat against corruption (GSAC), member of the Network, co-organized with the Organization for Economic Cooperation and Development, the Greece Public Integrity Forum, in which the High Authority for transparency in public life, another member of the Network for integrity, was invited to take part. This forum was an opportunity to discuss topics at the heart of current reforms in Greece, from prevention and management of conflicts of interests to whistleblowers’ protection, including political parties financing and open government, from a national and international point of views. The different sessions, whether during the interventions or in the questions from the audience, allowed to highlight the importance of transparency in preventing conflicts of interests, in the political parties financing, in the overall functioning of the administration and in public policies design, but also as a tool to fight corruption and restore citizens’ confidence in public officials. This forum was also an occasion for the Greek Secretariat against corruption to present its annual report for 2016. 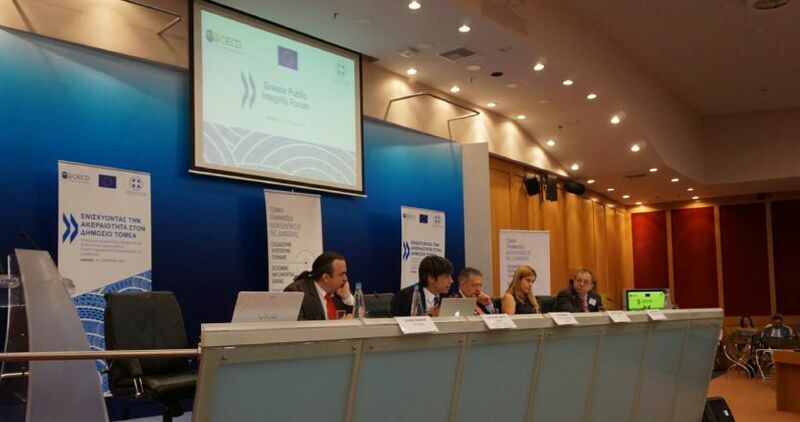 The presentation mentioned its coordinating action with regard to the implementation of the national anticorruption strategic plan, but also this year legislative initiatives to complete the Greek anticorruption schemes and trainings, awareness-raising and mobilisation sessions that have been organised by the Secretariat. In parallel, Guillaume Valette-Valla and Emilie Cazenave for the High Authority and Konstantinos Christou, Iraklis Barogiannis and Panagiota Giavri for the General Secretariat against corruption were able to discuss the entry into force of the Charter of the Network and the first actions to be led in the upcoming months on ethics and promotion of integrity of public officials.